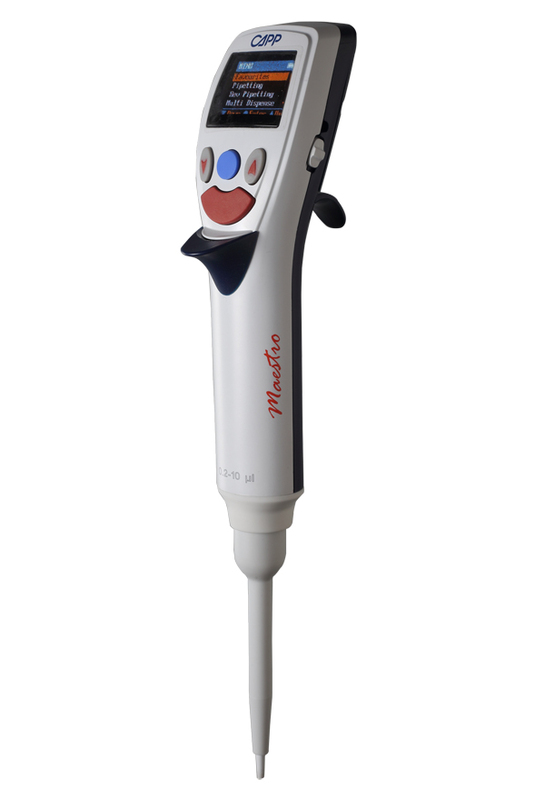 CappMaestro electronic single channel pipette is one of the most user friendly digital pipettes on the market. Capp single channel electronic pipette will optimize your serial work with advanced functions such as multi dispensing, dilution and mixing - all available while easily navigating through the self-explanatory graphic user interface. Optimize your routine lab work with Capp digital pipettes. With CappMaestro single channel electronic pipette you can easily store your favorite protocols and switch from one to the other in a matter of 2 clicks. Capp electronic single channel pipettes are all equipped with long lasting lithium batteries enabling many hours of uninterrupted work. You can also use Capp digital pipettes while on charging. Calibration and password setting functions are also available on CappMaestro. Contact us to receive Capp electronic single channel pipette for a free trial. for better optical control and contrast while pipetting. Greater screen refresh rate and less power consumption compared to other LCD screens. and elegant ergonomic design with wide hook allow you to rest the pipette in the palm of your hand with no need to actually ’grab it’. works as a finger rest for your thumb. Simply rest your thumb on the tip ejector and gently activate the pipetting button at the same time.